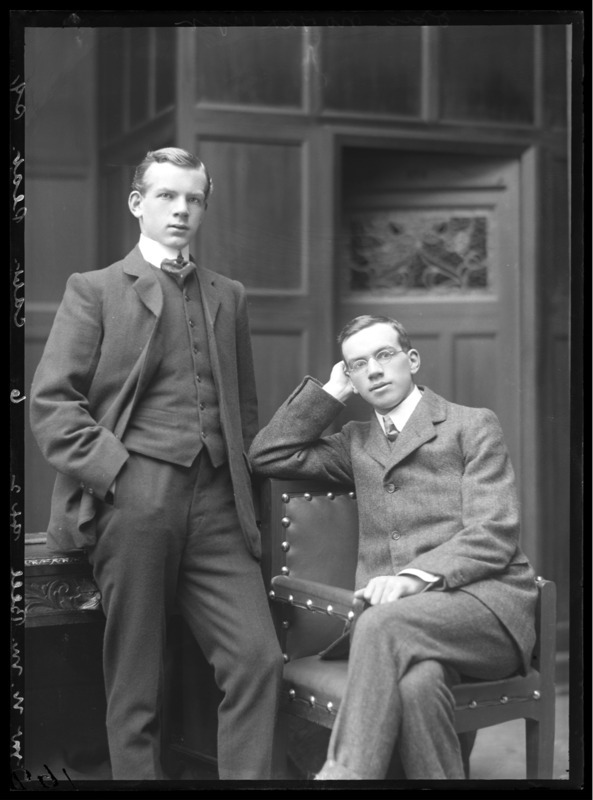 N . M. (Norman) Bell (right) conscientious objector, seen here with another young man, probably his brother Harold. 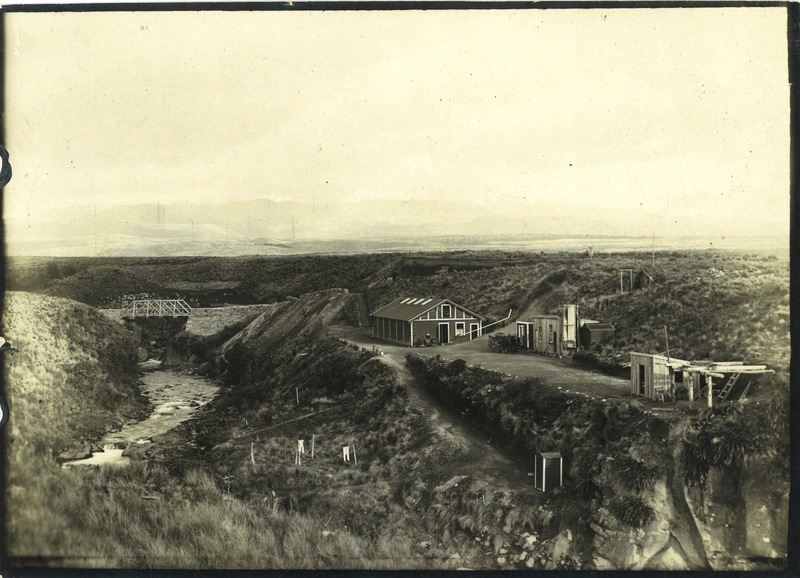 Photograph of Rotoaira Prison camp number two and Whakapapanui stone bridge, 1918. Norman Bell’s outstanding academic career had prepared him to take an educated and thoughtful view of international affairs. Born in Auckland in 1887, Bell’s education began at primary school in Lyttelton, where his father was a railway clerk. His education continued at Christ’s College where he won entrance scholarships each year from 1900 to 1904 and numerous prizes and honours for his scholastic success. In 1904 he was ‘Head of School’ the term used for the top academic student and came third on the list of Junior National Scholarship winners for the University of New Zealand in 1905. At Canterbury College he won further prizes and scholarships. He graduated BA in 1908 with two senior scholarships in Greek and chemistry and went on to gain his M.A. with first class honours in classics and second class honours in chemistry. He also became the first student to win a scholarship offered by Trinity College, Cambridge, to a distinguished student from Canterbury College. He was given a grand farewell by Canterbury College in August 1909, and over the next six years studied at Cambridge and Liverpool Universities and gained a Bachelor of Divinity degree, with first class honours, from London University. In 1914 and 1915 he was a research student in education and chemistry at St Andrew’s University and was said to be doing ‘chemical research work for the British Government in connexion with the war’. Meanwhile his brother Harold was reported to have been among the first to land at the Dardanelles. In 1915 Bell went to the University of Berne, Switzerland, where he was a candidate in Philosophy, but by 1916 was back in Christchurch teaching at Christchurch Boys’ High School. His teaching career was short-lived. Bell was sentenced to 28 days detention in June 1917 after refusing to take a medical examination, a stand he took despite knowing that due to his poor eye sight he would not pass the medical test. His court martial was at Trentham Military Camp and he served his two-year prison sentence in Rotoaira Prison south of Lake Taupo, where the conscientious objectors were put to work road-building. According to a friend he had ‘begged to be sent to the trenches with his brother, just on the grounds that prison was safer and more comfortable, and that it was not danger he wished to avoid; but “sin”’. While his objections to military service were religious, he didn’t identify with a church but described himself as ‘a student of religions’. Bell was released on 12 April 1919. He had not appeared before the Religious Objectors’ Advisory Board and perhaps because of this, was placed on the military defaulters list which meant he lost his civil rights for ten years. Not appearing before the board was almost certainly a principled stand because of the unfairness surrounding the treatment of conscientious objectors still in prison at the end of the war. Those who were deemed by the Board to have ‘genuine’ religious convictions were to be released ahead of those whom the Government considered to be ‘defiant’. Bell, who had religious objections, would not have wanted to receive preferential treatment ahead of other highly principled conscientious objectors. A friend of Bell’s wrote to Sir James Allen, Minister of Defence, pleading that Bell be removed from the defaulters’ list. However, reflecting how completely at variance the views of the COs were with the majority view of the day Allen replied that he could not understand how a conscience can be created ‘which permits a man to escape his duty to his country, thereby possibly saving his life: whilst others give themselves for their country’s safety’. As well as not being able to resume his teaching career, with his civil rights withdrawn, Bell was unable to vote or stand for election in any local body or national elections. In 1919 he was named as a nominee of the Christchurch North branch of the Labour Party for either the Avon or Lyttelton electorates, an action no doubt designed to highlight the Government’s treatment of certain conscientious objectors. This action appears peculiarly arbitrary, vindictive and unjust’ said the branch, ‘as by depriving men of their political and civil rights the Government is also depriving them of their means of livelihood. We believe this penalisation of men who have followed their convictions is not only a personal but a national calamity. Bell became a private tutor, coaching students in chemistry, physics, mathematics and languages, including German, French, Greek, Maori, Hebrew and Esperanto. He also became a tutor at the Canterbury Workers’ Educational Association (WEA) starting with an evening series of lectures on sociology in 1919. Over the years he also lectured on ‘Psychology in Our Everyday Life’, international relations, and taught the international language Esperanto. In June 1920 he gave a lecture on ‘Russia Old and New’ at the Trades Hall, with a collection to be taken up in aid of the Socialist Boys’ Club. The following year he was reported to be working with Blanche Baughan in arranging a series of concerts and lantern lectures at ‘our various prisons’. Bell was one of the teachers of the Socialist Sunday School which had up to 120 children on the roll when it began in 1918. A group from that school was still meeting as a socialist discussion group in 1932, when the Sunday school was reinvented as the ‘Socialist Guild of Youth’. With Fred Page he edited the International Sunbeam magazine for the Sunday School, and later edited Cosmos, a quarterly journal of pacifist thought. A meeting of the No More War Committee ca. 1930. 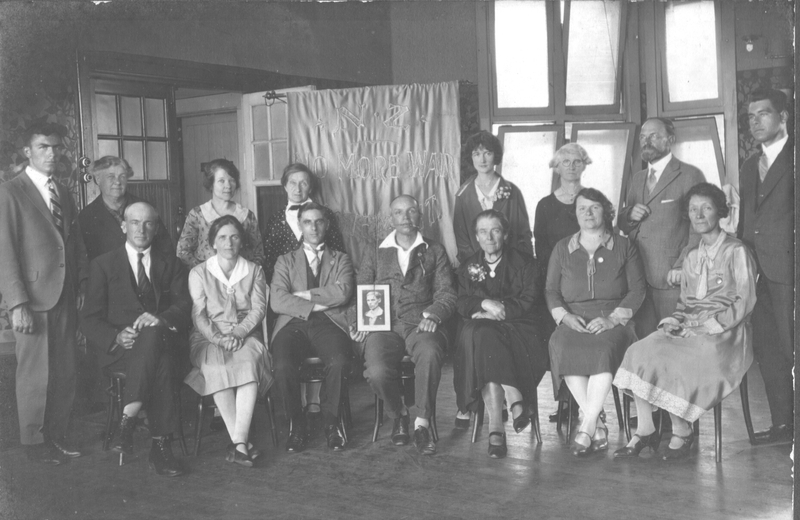 Norman Bell, seated centre, is holding a photo of Fred Page, who had recently died in Paris. Sarah Page is sitting on Bell's left. Standing second from the right is Charles Mackie, with Lincoln Efford on his left. 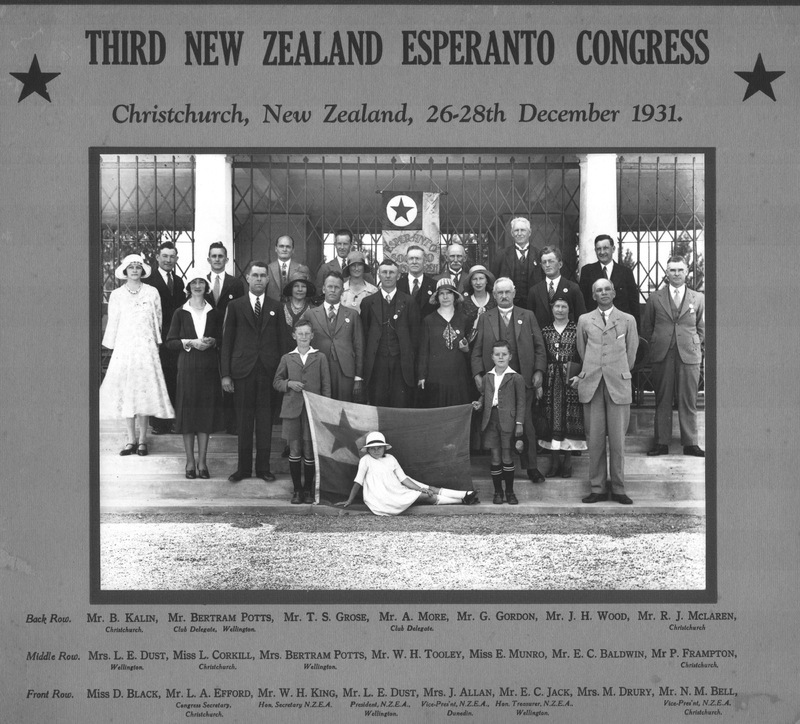 The Third New Zealand Esperanto Congress, held in Christchurch in December 1931. Norman Bell is standing front right. urged members to seek to remove the fundamental causes of war, and to direct their efforts towards the establishment of economic justice and international brotherhood. As the causes of war were economic, he said, the evolution of a saner and more just system would render war impossible, and national armaments needless. He also stressed the need for self-determination for all people including those in Samoa and India. For many years Bell represented the National Peace Council on the Labour Representation Committee, withdrawing on a matter of principle, when the Labour Party required its officials to sign a declaration saying that they would abide by all decisions of the party, which would include all future decisions. The No More War Movement took care to ensure that members pledged themselves to a declaration of principles, rather than to future action. Bell died in 1962 and was remembered as a teacher and for his brilliant academic career, but also as a well-known worker for peace and for the welfare of animals. N.M. Bell to Charles Mackie, 22 September 1918, Mackie Papers, Series 599,Box 17, Folder 63, Canterbury Museum, Christchurch. Information supplied by Jane Teal, Archivist Christ’s College, 4 August 2016; ‘University Exams’, Poverty Bay Herald, 20 January 1905, p.2; BELL, Norman Murray – WW1 64795 - Army, Archives New Zealand/Te Rua Mahara o te Kāwanatanga, Wellington office [Archives Reference: R22274432]. ‘Advertisements column’, New Zealand Herald, 2 April 1909.p.5; ‘Farewell to Mr N.M. Bell’, Press, 10 August 1909, p.9; James Hight and Alice Candy, A Short History of the Canterbury College, (Christchurch: Whitcombe and Tombs, 1927), p.246. ‘Personal Items’, Press, 8 September 1915, p.8; Hight and Candy, A Short History of the Canterbury College, p.246. He had been wounded but was eager to rejoin his company. ‘Personals’, Sun, 8 September 1915, p.4. P. MacCallum to Sir James Allen, 2 June 1919, (AAYS 8638 AD1 box 734 10/407 pt 3), Archives New Zealand Wellington; BELL, Norman Murray – WW1 64795 - Army, Archives New Zealand/Te Rua Mahara o te Kāwanatanga, Wellington office [Archives Reference: R22274432]. ‘Conscientious Objectors’, Letter to the Editor from B.E. Baughan, Press, 16 March 1918, p.7. P. MacCallum to Sir James Allen, 2 June 1919, (AAYS 8638 AD1 box 734 10/407 pt 3), Archives New Zealand Wellington. ‘The Coming Elections: Christchurch North’, Maoriland Worker, 18 June 1919, p.5. Hight and Candy, A Short History of the Canterbury College, p. 246; ‘General News’, Press, 13 May 1919, p.6; ‘Mr N.M. Bell’, Press, 8 August 1962, p.15. ‘General News’, Press, 29 May 1922, p.6; Ian Dougherty, The People’s University: A Centennial History of the Canterbury Workers’ Educational Association 1915 – 2015, (Christchurch: Canterbury University Press, 2015) p.85. Advertisements Column, Star, 5 June 1920, p.1. ‘Women’s Corner’, Press, 5 September 1921, p.2. ‘The Socialist Party: Sunday School Formed’, Press, 30 May 1932, p.3. The International Sunbeam, Volume I No. 9, November 1925, Roth Herbert Otto, 1917-1994: Papers, 82-213-07, Pacifism in New Zealand, Alexander Turnbull Library; Cosmos, January 1940, Norman Bell Papers, Arch 280/7 (MS86), Christchurch City Libraries. ‘No More War Movement: Dominion Conference’, Press, 6 January 1931, p.4. Elsie Locke, Peace People: A History of Peace Activities in New Zealand, (Christchurch: Hazard Press, 1992), p.74; Ellen and Ann Saunders, 'He's for the Morning’: Alfred William Page: His Journal: Also some recollections of his life, (Christchurch: A.Wildey, 1939), pp. 57-59. ‘Mr N.M. Bell’, Press, 8 August 1962, p.15.